Catbird (@Catbirdnyc), a Brooklyn-based jewelry and gift shop, is a great example of how to build a memorable retail brand and a truly engaged community of evangelists in the digital age. 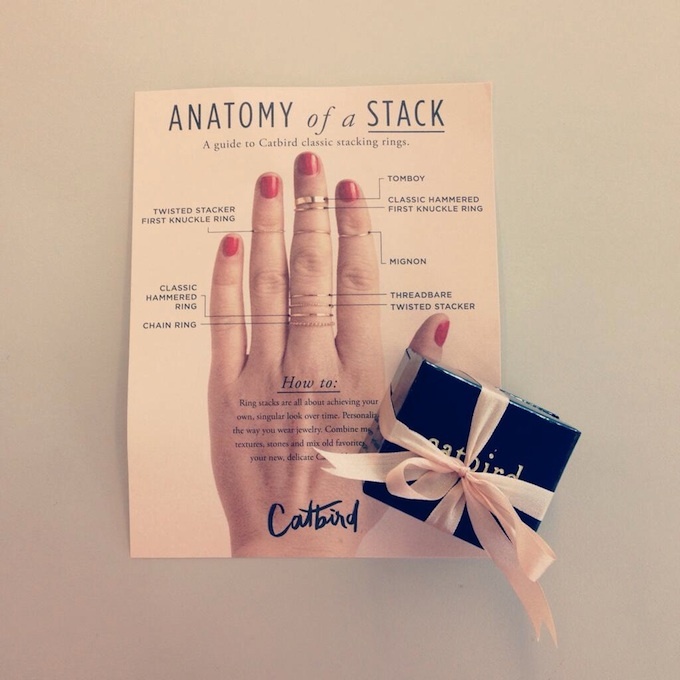 A ring stacking guide comes with the purchase of Catbird’s signature stacking rings. Earlier this month, Catbird released a tutorial video with Racked that shows customers how to stack their rings (video below). This alone may not seem like anything out of the ordinary for a boutique known for it’s tiny, delicate jewelry, but when you look at the overall picture, it underscores how Catbird is ahead of the curve when it comes to retail branding and community engagement. Catbird’s name has been coming up a lot lately in my daily work-related conversations with accessories editors, jewelry bloggers and friends. Which made me want to take a closer look. Retailers from multi-brand brick and mortar establishments to single-label e-commerce shops could learn a lot from Catbird’s proactive approach to branding and PR. Yesterday, we talked about the 7 features that every business website should have. Not only does Catbird have all seven of those features, they also have so much more. Their website is jam-packed with information about the brand, but it doesn’t feel overcrowded. I love how one of the featured products is a link to their popular stacking rings, because this is probably the product that most new Catbird customers learn about first from their friends or other influencers. Having this information front and center makes a lot of sense. Everything else on the homepage is also well-placed so whatever you’re looking for whether it’s the Catbird blog, social media links or product pages you can find at-a-glance. Many business owners become defensive when a PR firm or brand manager suggests that they talk about more than just themselves or their products. That’s because they don’t understand that nowadays it’s all about the lifestyle brand and how a product or service will fit into a customer’s lifestyle. This means that retailers should get comfortable with the idea that the narrative may not always be about them. Catbird does a great job of putting the focus on their customers with their How We Wear It feature which shows off the many ways their products can be worn ‘in the wild.’ They also extend their customer love beyond the website and onto their social media pages. Content creation is a big buzz word in PR and marketing circles right now, but a lot of businesses are doing it wrong. When creating content for a business, it’s important to put the customers first and think about what information they’d need and what information they’d want to share with their friends about your business. Catbird’s ring stacking guide and video is a simple, yet brilliant example of content that is inherently social. Not only does it provide the customer with insight into how they can style their new purchase, it also suggestively sells other merchandise that they may not have. And it’s presented in a visually appealing way that allows people to share it across their social networks.